A NASA research team of scientists at the Johnson Space Center and at Stanford University has found evidence that strongly suggests primitive life may have existed on Mars more than 3.6 billion years ago. — NASA, 7 August 1996 (1). When one calculates the likelihood of life's origin, one finds that it is extremely low. Originating by chance, life anywhere in the universe should be rare. Actually, Darwinists are not sure how unlikely extraterrestrial life is. They agree it's probably rare, but if it is too rare, that weakens the case for its by-chance origin on Earth. Richard Dawkins allows three possibilities: life is likely to arise only 1) once per universe, 2) once per galaxy, or 3) once per solar system (2). Others such as John Barrow and Frank Tipler in The Anthropic Cosmological Principle say firmly, "...the universe has to be as big as it is in order to support just one lonely outpost of life" (3). "...The consensus of modern evolutionists is that the evolution of life on Earth ...is so improbable that it is most unlikely to occur elsewhere in our galaxy" (4). Common sense says that if life begins by chance, it's rare. Cosmic Ancestry predicts that life will be found anywhere it can get a toehold. If it exists on one planet, other planets orbiting the same star were very likely exposed to it. Therefore, Cosmic Ancestry predicts that other planets within our own solar system should show evidence of life. Now of course, after David McKay's team from NASA published its findings (5), it looks like a reasonable bet that Mars once had life. Intriguing photos like the one above and others, showing what NASA believes are fossilized "nanobacteria," were accompanied by analyses of chemical layers that are best explained by biological activity. Maybe Mars even has life, today. The evidence sent back from Mars by two Viking Landers in 1976 and 1977 was not clearcut (6). In fact, NASA's first press release about the Viking tests announced that the results were positive. The "Labelled Release" (LR) experiments had given positive results. But after lengthy discussions in which Carl Sagan participated, NASA reversed its position, mainly because another experiment detected no organics in the soil. Yet Gilbert V. Levin, the principal designer of the LR experiment, still believes the tests pointed to life on Mars (7). When the same two experiments were run on soil from Antarctica, the same conflicting results were obtained (LR - positive; organics - negative.) Soil from Antarctica definitely contains life. The test for organics was negative because it is far less sensitive than the LR experiment. The same problem could have caused the organics test on Mars to give a false negative. It is interesting to remember that before oxygen could accumulate in Earth's atmosphere, all the exposed iron had to rust. During that process, lasting hundreds of millions of years, Earth was also a red planet. Could the oxygen that rusted the iron on Mars have been produced biologically? Could life on Mars have simply "run out of steam" after that stage of its development? "Cells might not divide... Cells will divide. "Biochemical pathways might be unrecognizable... Some biochemical pathways might be unfamiliar, as some are on Earth. "Biomolecules might not be homochiral... Biomolecules will be homochiral, with righthanded nucleotides and lefthanded amino acids. "Cells might not be necessary... Cells will be necessary. This point -- that any life must have at least what a "simple" cell has -- is the foundation of Cosmic Ancestry. "Genetic coding might be different... Genetic coding might vary slightly from that on Earth, just as there are minor variations among the codings actually found on Earth. "Genetic material might be different.... Very speculatively, might the genetic templates even be inorganic?" The DNA–RNA–protein system will be conserved, and martian ribosomes will resemble earthly ones. Even if life on Mars is just like life on Earth, that won't prove the case for Cosmic Ancestry. It could be taken as evidence for a weaker form of panspermia variously called "impact panspermia," "ballistic panspermia," or "litho-panspermia," in which cells are carried to neighboring planets on the debris ejected by major impacts (11). (This idea was prominently mentioned following NASA's August 7, 1996, announcement — maybe life originated there instead of here.) Ignoring panspermia altogether, martian life with the same system as ours could be used as evidence that the origin of our kind of life, from chemicals, is easy after all. The Darwinian paradigm is tenacious. One benefit of the recent analysis of the Mars meteorite is an improvement in methods of analyzing meteorites for the presence of fossils. It would be interesting to use the new methods on carbonaceous chondites — meteorites not from Mars but from spent comets, most likely. Examples are the Murchison, Orgueil, Ivuna or Allende meteorites, where earlier researchers using older methods have already seen what they believed to be fossilized microbes. Fortunately, this effort is already under way, with very interesting results announced on July 29, 1997, in San Diego, by NASA scientist Richard Hoover (12). Independent confirmation of a methane spike on Mars and a source region east of Gale Crater, by Marco Giuranna et al., Nature Geoscience, Apr 2019. New Evidence of Deep Groundwater on Mars, by Amy Blumenthal, USC (+Newswise), 28 Mar 2019. Persistence of intense, climate-driven runoff late in Mars history, by E.S. Kite et al., Science Advances, 27 Mar 2019. First evidence of planet-wide groundwater system on Mars, ESA, 28 Feb 2019. ...evidence for trace fossils at ...Gale Crater, Mars by Barry DiGregorio for Mars Daily, 24 Dec 2018. 21 Dec 2018: Korolev crater on Mars, 82 kilometers in diameter, holds permanent ice almost 2 kilometers deep. 17 Dec 2018: The Mars 2020 rover is aimed at Jezero Crater, a likely place to look for past life, NASA says. Martian methane–spotted in 2004–has mysteriously vanished by Paul Voosen, Science, 12 Dec 2018. 02 Oct 2018: Cyanobacteria thrive in the deep continental subsurface without light or oxygen. 25 Jul 2018: We interpret this feature as a stable body of liquid water on Mars. When a Mars Simulation Goes Wrong by Marina Koren, The Atlantic, 22 Jun 2018. Mars beat Earth in the race for habitable conditions by Linda T. Elkins-Tanton, Nature, 27 Jun 2018. 07 Jun 2018: Data from the Curiosity rover are consistent with life on Mars. Update, 10 May 2018: new insight pertaining to A fossil on Mars resembles one on Earth, posted 28 Oct 2015. 26 Apr 2018: ...it is natural to ask whether methane on Mars is also of biologic origin. Delivery of organics to Mars through asteroid and comet impacts by Kateryna Frantseva et al., Icarus, online 09 Mar 2018; and commentary from Mars Daily, 14 Mar 2018. 21 Mar 2018: Mars' ocean formed before or during the rise of the Tharsis volcanic plateau. 27 Feb 2018: ...hope for life on Mars. Huge Water Reserves Found All Over Mars by Michael Greshko, National Geographic, 11 Jan 2017. Methane Seepage on Mars: Where to Look and Why by D. Z. Oehler and G. Etiope, Astrobiology, 01 Dec 2017. Mars methane rises and falls with the seasons by Eric Hand, Science, 05 Jan 2018. Recurring Martian Streaks: Flowing Sand, Not Water?, NASA JPL, 20 Nov 2017. 12 Dec 2017: ...the possibility that atmospheric gases support life on other planets. Granular flows at recurring slope lineae on Mars indicate a limited role for liquid water by Colin M. Dundas et al., doi:10.1038/s41561-017-0012-5, Nature Geoscience, online 20 Nov 2017. 18 Nov 2017: ...that long-term preservation of microbial life inside Martian permafrost is possible. Study estimates amount of water needed to carve Martian valleys, MarsDaily, 06 Jun 2017. Thanks, Ron McGhee. 03 Jun 2017: an ancient, habitable lake environment ...sustained for tens of thousands to tens of millions of years. Atmospheric Constraints on the Surface UV Environment of Mars at 3.9 Ga Relevant to Prebiotic Chemistry by S. Ranjan, R. Wordsworth and D. Sasselov, doi:10.1089/ast.2016.1596, Astrobiology, online 24 May 2017. New Evidence for a Water-Rich History on Mars, by Glenn Roberts Jr., Berkeley Lab (+Newswise), 06 Mar 2017. 02 Mar 2017: ...at least one methanogen could survive in the deep subsurface environment of Mars. Low Hesperian PCO2 constrained from in situ mineralogical analysis at Gale Crater, Mars by Thomas F. Bristow et al., doi:10.1073/pnas.1616649114, PNAS, online 06 Feb 2017. ...other mechanisms of warming Hesperian Mars, or processes that allowed for confined hydrological activity under cold conditions, must be sought. Bursts of methane may have warmed early Mars, by Leah Burrows, Harvard Paulson School, 24 Jan 2017. Long Window for Life on Mars: Hundreds of Millions of Years? by Mike Wall, Space.com, 14 Dec 2016. 03 Dec 2016: Evidence for past life on Mars from images taken in Gusev crater in 2007. NASA's Bold Plan to Hunt for Fossils on Mars, by Mark Strauss, National Geographic, 20 Oct 2016. Europe's probe feared lost on Mars, by Elizabeth Gibney, Nature, updated 20 Oct 2016. Visions of Life on Mars in Earth's Depths by Kenneth Chang, The New York Times, 12 Sep 2016. Extensive Noachian fluvial systems in Arabia Terra: Implications for early Martian climate by J.M. Davis et al., doi:10.1130/G38247.1, Geology, online Aug 2016. Fluids during diagenesis and sulfate vein formation in sediments at Gale crater, Mars by S.P. Schwenzer et al., doi:10.1111/maps.12668, Meteoritics & Planetary Science, online 20 Jul 2016. New evidence of where life might exist on Mars by Ashley Strickland, CNN, 15 Jul 2016. Hypotheses for Near-Surface Exchange of Methane on Mars by Hu Renyu, Bloom A. Anthony, Gao Peter, Miller Charles E., and Yung Yuk L., doi:10.1089/ast.2015.1410, Astrobiology, online 17 Jun 2016. Ancient tsunami evidence on Mars reveals life potential by Blaine Friedlander, Cornell University (+Newswise), 19 May 2016. Martian water on the boil, doi:10.1038/533011b, Nature, online 4 May 2016. Super Saturation or Mars' atmosphere is the subject of email from Ron McGhee, 30 Apr 2016. 14 Apr 2016: NASA studies how to grow potatoes on Mars. Could Water Have Carved Channels On Mars...?, Astrobiology Magazine, 19 Mar 2016. 27 Feb 2016: Antarctic fungi survive Martian conditions on the International Space Station (links). The Last Possible Outposts for Life on Mars by Alfonso F. Davila and Dirk Schulze-Makuch, doi:10.1089/ast.2015.1380, Astrobiology, 16 Feb 2016. If our thought process is correct, it implies the possibility of life on Mars until relatively recent times, perhaps even the present. 1 Nov 2015: Ron McGhee thinks a rock at the Spirit rover landing site may be petrified wood. 28 Oct 2015: A fossil on Mars resembles one on Earth. Updated, 10 May 2018. Deposition, exhumation, and paleoclimate of an ancient lake deposit, Gale crater, Mars, by J. P. Grotzinger et al., doi:10.1126/science.aac7575, Science, 9 Oct 2015; and commentary: NASA's Curiosity Rover Team Confirms Ancient Lakes on Mars, NASA (+Space.com by Mike Wall), 8 Oct 2015. Thanks, Lawrence Klaes. 28 Sep 2015: There is water on Mars! This is the latest news from NASA. et seq. 17 Jun 2015: Several Mars meteorites contain methane. 3 Jun 2015: Research suggests that methanogens could survive on Mars. ...Evidence of Briny Water on Mars, University of Arkansas (+Newswise), 4 May 2015. 20 Apr 2015: The hypothesis that there is still life present on Mars today remains a viable one. Ancient Martian lake system records two water-related events, Brown University, 25 Mar 2015. 11 Mar 2015: A primitive ocean on Mars held more water than Earth's Arctic Ocean. 10 Feb 2015: Venter says that Mars definitely had life. 7 Jan 2015: Rocks photographed by NASA's Curiosity rover on Mars resemble biologically formed ones on Earth. Mars Curiosity rover finds evidence of ancient lakes in Gale crater by Eric Hand, Science, 8 Dec 2014. 3 Dec 2014: The Tissint meteorite contains organic carbon that may be evidence for past life on Mars. 5 Aug 2014: ...Aqueous solutions could form temporarily ...on the Martian surface and in the shallow subsurface. Mars slow to yield its secrets by Alexandra Witze, Nature News, 23 Jul 2014. 20 May 2014: ...Methanogens could potentially inhabit the subsurface of Mars. NASA missions bid for extensions by Alexandra Witze, Nature News, 25 Mar 2014. 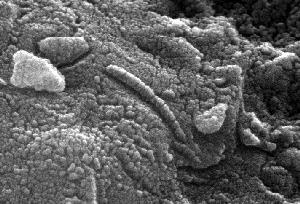 Tiny Blobs and Tunnels in Meteorite Revive Debate Over Life on Mars by Alan Boyle, NBC News, 25 Feb 2014. 28 Jan 2014: Old Mars rover finds signs of ancient water, by Alexandra Witze, Nature. 25 Dec 2013: ...water may still run across the surface from time to time. 11 Oct 2013: DNA repair mechanisms could allow life to persist on Mars. Water on Mars "discovered" by Curiosity is actually not news at all, says Gil Levin, 27 Sep 2013. Not a Whiff of Life on Mars by Adrian Cho, Science Now, 19 Sep 2013. 30 Aug 2013: Life on Earth may have come from Mars, acording to Steve Benner. 26 Jul 2013: Did NASA's Opportunity rover find evidence for life on Mars in 2004? R. M. E. Williams et al., "Martian Fluvial Conglomerates at Gale Crater" [abstract], doi:10.1126/science.1237317, p1068-1072; and commentary by Douglas J. Jerolmack, "Pebbles on Mars" [abstract], doi:10.1126/science.1239343, p1055-1056; v340, Science, 31 May 2013. Bacterium from Canadian High Arctic and life on Mars, McGill University (also ScienceDaily), 22 May 2013. Richard A. Kerr, "Life Could Have Thrived on Mars, but Did It? Curiosity Still Has No Clue" [summary], doi:10.1126/science.339.6126.1373, p1373 v339, Science, 22 Mar 2013. NASA Rover Finds Conditions Once Suited for Ancient Life on Mars, NASA, 12 Mar 2013. Meteorite carries ancient water from Mars by Ron Cowen, doi:10.1038/nature.2013.12145, Nature.com, 3 Jan 2013. Curiosity finds no methane on Mars — not yet, anyway by Mike Wall, NBCNews.com, 2 Nov 2012. Could Martian Bacteria Have Seeded Earth? by Jeffrey Kluger, TIME Science & Space, 11 Oct 2012. H. Chennaoui Aoudjehane et al., "Tissint Martian Meteorite: A Fresh Look at the Interior, Surface, and Atmosphere of Mars " [abstract], doi:10.1126/science.1224514, Science, online 11 Oct 2012. 6 Aug 2012: The Curiosity rover landed in Gale Crater on Mars, at 1:32AM EDT. Extensive Water in Mars Interior, Carnegie Institution of Washington, 21 Jun 2012. 25 May 2012: Did Mars ever support life? If so, evidence thereof in ancient Mars meteorites might be cryptic. 3 May 2012: A new Mars meteorite may contain biological fossils, according to Prof. Chandra Wickramasinghe's team at BCAB. 24 Apr 2012: An astrobiologist is leading a group of 20 scientists in calling for a mission to Mars with a strong and comprehensive life detection component. 18 Feb 2012: Methane on Mars is the subject of controversy at NASA. Reaching for the stars: It's alive out there! Scientists seek out the evidence by Marc Kaufman, Physorg.com, 8 Jun 2011. 6 May 2011: Methane on Mars may come from life in surface fractures around the giant Isidis impact basin. Space Forensics Might Point to a Martian Ancestry by Ray Villard, Discovery News, 26 Mar 2011. 15 Jan 2011: NASA sees no life on Mars, but the photos are suggestive and fun to see. Richard A. Kerr, "Liquid Water Found on Mars, But It's Still a Hard Road for Life" [summary], doi:10.1126/science.330.6004.571-a, p571 v330, Science, 29 Oct 2010. Richard A. Kerr, "Growing Prospects For Life on Mars Divide Astrobiologists" [summary], doi:10.1126/science.330.6000.26, p26-27 v330, Science, 1 Oct 2010. Martian Volcano Mud May Have Hosted Life by Phil Berardelli, ScienceNow, 20 Aug 2010. Barry E. DiGregorio, "Mars: The Next Decade" [cover story, see right], p46-53 v55, Earth, Aug 2010. ...Widespread Glacial Meltwater Valleys on Mars by Richard Lewis, Brown University, 23 Jun 2010. ...Mars's Frozen Water Cycle by Adam Mann, ScienceNow, 11 Jun 2010. New model is proposed to explain absence of organic compounds on surface of Mars, EurekAlert, 10 Jun 2010. 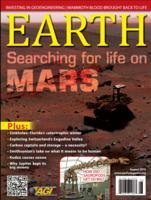 Mars rover finds conditions 'more conducive to life' by Richard A. Lovett, doi:10.1038/news.2010.278, NatureNews, 3 Jun 2010. Could life survive on Mars? Yes, expert says, McGill University, (also EurekAlert), 7 Jun 2010. 10 May 2010: We Are Not Alone, a new book about astrobiology. Rocks reveal red planet dry out, posted by Daniel Cressey, Nature.com, 12 Feb 2010. 15 Feb 2010: The possibility that life was shared between Earth and Mars could be tested with a DNA analyzer. Katharine Sandeson, "A whiff of mystery on Mars," p420-421 v463, Nature, 28 Jan 2010. 10 Feb 2010: Schoolteacher Melissa West likes this page and recommends a link. Spectacular Mars images reveal evidence of ancient lakes, EurekAlert!, 4 Jan 2010. Shane Byrne et al., "Distribution of Mid-Latitude Ground Ice on Mars from New Impact Craters" [abstract], doi:10.1126/science.1175307, p1674-1676 v325, Science, 25 Sep 2009. 1 Sept 2009: "Is There Life on Mars?" will be shown tonight on PBS. Many characteristics of Mars, including ice, are similar to Earth, paper says, EurekAlert!, 2 Jul 2009. ...First Definitive Evidence for Ancient Lake on Mars, University of Colorado at Boulder, 17 Jun 2009. S. W. Squyres et al., "Exploration of Victoria Crater by the Mars Rover Opportunity" [abstract], doi:10.1126/science.1170355, p 1058-1061 v 324, Science, 22 May 2009; also commentary: Windy, Wet and Wild: Victoria Crater Unveils More of Mars' Geologic Past, Cornell University, 21 May 2009. 13 May 2009: Rivers flowed on Mars more recently than once believed. 17 Apr 2009: Microbial life trapped in darkness under ice accounts for the "Blood Falls" at the snout of Taylor Glacier in Antarctica. 10 Apr 2009: Jerry Chancellor sends a link about DNA analysis on Mars. Mars orbiter plans to map out methane plumes, doi:10.1038/458137e, p 137 v 458, Nature, online 11 Mar 2009. Rice Study Hints At Water - And Life - Under Olympus Mons, MarsDaily.com, 5 Mar 2009. 1 Mar 2009: Russia plans to send a variety of microbes and larger life on a round-trip to Phobos in October. 22 Feb 2009: ...Living microbes could have survived both the launch and travel.... — H. Jay Melosh. 18 Feb 2009: Liquid water on Phoenix lander's leg? 16 Jan 2009: Methane plumes on Mars may come from life. Ailish M. Kress and James W. Head, "Ring-mold craters in lineated valley fill and lobate debris aprons on Mars: Evidence for subsurface glacial ice" [abstract], doi:10.1029/2008GL035501, v 35, L23206, Geophys. Res. Lett., 30 Sep 2008. 26 Nov 2008: Huge glaciers buried under debris have been detected at low latitudes on Mars by means of ground-penetrating radar. Ronnie McGhee replies with a question about the Phoenix Mars Lander, 5 Nov 2008. 25 Oct 2008: On Mars, plumes of methane hundreds of kilometres across bloom and dissipate in less than a year. Phoenix Finds Signs of Once-Liquid Water on Mars, by Richard Kerr, ScienceNOW Daily News, 30 Sep 2008. Water may have existed on some parts of Mars longer than previously believed, Yahoo! News, 17 Sep 2008. ...Diverse, Wet Environments on Ancient Mars, Newswise.com, 16 Jul 2008. Rain on the Martian Plain?, by Phil Berardelli, ScienceNOW Daily News, 2 Jul 2008. Mars OK for Life, So Far, by Richard A. Kerr, ScienceNOW Daily News, 26 Jun 2008. 11 June 2008: We will see organics, for sure, because we're bringing them. Foot-Dragging Mars Rover Finds Yellowstone-Like Hot Spring Deposits, MarsDaily.com, 23 May 2008. Sand Dunes Thawing on Mars, Astronomy Picture of the Day, 3 Mar 2008. Mars rovers find new evidence of 'habitable niche'..., by Lauren Gold, Cornell University, 21 Dec 2007. In Search for Water on Mars, Clues from Antarctica, by Pam Frost Gorder, Ohio State University, 7 Dec 2007. "Mars Reconnaissance Orbiter," six articles in a Special Section [Introduction], p 1705-1719 v 317, Science, 21 Sep 2007. Strong evidence that Mars once had an ocean, by Robert Sanders, UC Berkeley News, 13 Jun 2007. Model Methanogens Provide Clues to Possible Mars Life, Newswise.com, 23 May 2007. M.Allen et al., "Is Mars Alive?" [pdf], p 433-448 n 41 v 87, EOS, Transactions, American Geophysical Union, 10 Oct 2006. Isotopic analysis of methane and derivitaves. Hints of huge water reservoirs on Mars, by David Shiga, NewScientist.com news service, 25 Jan 2007. Dig deeper to find Martian life, EurekAlert!, 30 Jan 2007. NASA funds instrument to probe life on Mars, by Robert Sanders, UC Berkeley News, 11 Jan 2007. Water, Water Everywhere on Mars, by Phil Berardelli, ScienceNOW Daily News, 13 Dec 2006. 6 Dec 2006: Water still flows on Mars?! Mars May be Cozy Place for Hardy Microbes, Newswise.com, 19 Oct 2006. 21 Oct 2006: Bacteria deep underground subsist on radioactivity. Was There Water on Mars Long Enough for the Origination of Life?, Virginia Tech (Virginia Polytechnic Institute and State University), 18 Oct 2006. Hugh H. Kieffer et al., "CO2 jets formed by sublimation beneath translucent slab ice in Mars' seasonal south polar ice cap" [text], doi:10.1038/nature04945, p 793-796 v 442, Nature, 17 Aug 2006. A nonbiological account for some of the changing dark spots. Magma and Water on Mars, by G. Jeffrey Taylor, Planetary Science Research Discoveries (PSRD), 27 Dec 2005. Mars Express evidence for large aquifers on early Mars, European Space Agency, 30 Nov 2005. NASA Rover Helps Reveal Possible Secrets of Martian Life, NASA Mission News, 29 Nov 2005. 4 Nov 2005: Methane on Mars probably does not come from volcanoes. Committee on Preventing the Forward Contamination of Mars, National Research Council, Preventing the Forward Contamination of Mars [link], 180 pages, The National Academies Press, 2005. What Caused the Martian Floods?, by Mason Inman, ScienceNow, 22 Jul 2005. 20 July 2005: Frozen water on Mars may be 200 meters thick on the floor of a crater; and more about methane there. 8 June 2005: Mars' methane not from life? Wading in Martian Water, Astrobiology Magazine, 2 May 2005. You have to dig to find the story. 19 Apr 2005: Methane may come from life on Mars. 18 Mar 2005: Fresh-looking snow on Mars. Warming Up to a Martian Carcass (methane from decaying past life? ), by Leslie Mullen, Astrobiology Magazine, 16 Mar 2005. 15 Mar 2005: A frozen ocean on Mars today? Formaldehyde claim inflames martian debate, by Mark Pepow, news@nature.com, 25 Feb 2005. Mars may have a frozen sea, by Philip Ball, news@nature.com, 22 Feb 2005. Frozen sea discovered near Martian equator from 3D images of Mars Express, University College London, 22 Feb 2005. Martian water clues go wider and deeper, by David L Chandler, NewScientist.com, 18 Feb 2005. 16 Feb 2005: Formaldehyde on Mars. Rovers spot strange shapes on Mars, by Leonard David, MSNBC, 14 Feb 2005. Is There Life on Mars? Looking for Rock Solid Evidence, by Leonard David, Space.com, 14 Feb 2005. Martian Methane Mystery, Astrobiology Magazine, 9 Feb 2005. 29 Dec 2004: Methane on Mars. 13 Dec 2004: Panspermia and life on Mars. Proof of Water, Astrobiology Magazine, 7 Dec 2004. The Martian Methane Surprise: Interview with Mike Mumma, Astrobiology Magazine, 6 Dec 2004. 24 Nov 2004: Methane on Mars. More Evidence for Methane on Mars, RedNova, 22 Nov 2004. Not finding life? Dig deeper, EurekAlert!, 18 Nov 2004. Water from a Stone, by D. Bish et al., Astrobiology Magazine, 15 Nov 2004. Mars Gullies Likely Formed By Underground Aquifers, by Leonard David, Space.com, 12 Nov 2004. Richard A. Kerr, "Heavy Breathing on Mars?" [summary], p 29 v 306 Science, 1 Oct 2004. 4 Oct 2004: 36th Lunar and Planetary Science Conference, League City, Texas, 14-18 March 2005. A picture of young Mars: Reconstruction of the red planet's past reveals acid rain and briny seas, by Mark Peplow, News@Nature.com, 22 Sep 2004. 24 Sep 2004: Water vapor and methane concentrations are correlated in Mars' lower atmosphere. 31 Aug 2004: Changing spots on Mars. Kenneth Chang, "Mars Rover Finds Mysterious Rocks and More Signs of Water" [text], The New York Times, 19 Aug 2004. The search for life on Mars: more about methane there, by Mark Peplow, news@nature.com, 27 Jul 2004. The Red Planet – Dead Or Alive? re: "more effective and robust systems for detecting 'biomarkers'," ScienceDaily.com, 15 Jun 2004. Bringing Mars Home: edited testimony of Michael Carr, President's Commission on the Moon, Mars and Beyond, Astrobiology Magazine, 11 May 2004. MarsLife.com, "News & Comments on the life of Mars," frequently updated. 19 Apr 2004: Mars may have life today (The New York Times). 2 Apr 2004: ESA detects methane on Mars. Mineral in Mars 'Berries' Adds to Water Story, JPL, NASA, 18 Mar 2004. Water at Martian south pole, European Space Agency, 17 Mar 2004. 2 Mar 2004: Meridiani Planum was wet. What on Mars, serious images of Mars. Rovers Find Hints of Water in Soil Below Martian Surface, by Thomas H. Maugh II, Los Angeles Times, 20 Feb 2004. P. C. W. Davies, "Does Life's Rapid Appearance Imply a Martian Origin?" [abstract], p 673-679 v 3 n 4, Astrobiology, Winter 2003. 25 Jan 2004: Mars Rover "Opportunity" returns pictures. 24 Jan 2004: Mars Rover "Spirit" continues to malfunction. Mars Express sees its first water, European Space Agency, 23 Jan 2004. Oliver Morton, "Mars Revisited" [link], p 2-32 v 205, National Geographic, Jan 2004. Missions to Mars, Nature ongoing report, 2003. 4 Jan 2004: Rover "Spirit" bounced safely onto Mars. UF Researchers Preparing to Send Life to Mars, by Tim Lockette, University of Florida News, 22 Dec 2003. James W. Head et al., "Recent Ice Ages on Mars" [abstract], p 797-802 v 426, Nature, 18/25 Dec 2003. Down That Long Dusty Trail, by Usha Sutliff, USC News Service, 12 Dec 2003. 2003, November 14: Water flowed on Mars for long times. 2003, November 13: Europe's Mars sample return mission. Martian Chronicles II: Mission Loss, Astrobiology Magazine, 01 Oct 2003. What Iron Can Tell Us about Mars, by Stephen Hart, SpaceDaily.com, 29 Sep 2003. 2003, September 16: A river in Spain may model Mars' environment. Red planet's hue due to meteors, not water, by Hazel Muir, NewScientist.com, 4 Sep 2003. Gullied Slopes on Mars, by Linda M.V. Martel, Hawai'i Institute of Geophysics and Planetology, 29 Aug 2003. 2003, August 25: Could alien pathogens wreak havoc on our world? 2003, August 22: How wet was Mars? Martian warm spots could be towers of ice, by Rachel Nowak, NewScientist.com, 25 July 2003. Los Alamos releases new maps of Mars water, by Nancy Ambrosiano and Jim Danneskiold, Los Alamos National Laboratory, 24 July 2003. Ancient Floodwaters and Seas on Mars, by Linda M. V. Martel, Hawai'i Institute of Geophysics and Planetology, 16 July 2003. Mars: Winds of Change, Astrobiology Magazine, 12 July 2003. Mars Dust, Science@NASA, 9 July 2003. NASA's Odyssey Orbiter Watches a Frosty Mars, JPL, NASA, 26 June 2003. 2003, June 3: European Mars Express space probe is on the way to Mars. 2003, May 29: Mud flows on Mars? Launch of New NASA Mars Rover Pushed Back, The Associated Press, 28 May 2003. Robert Kunzig, "Mars Express," p 34-42 v 24 Discover, May 2003. Hitchhikers May Have Thumbed A Ride to Mars, by Leslie Mullen, Astrobiology Magazine, 9 Apr 2003; based on "Potassium Ferrate [Fe(VI)] does not mediate self-sterilization of a surrogate Martian soil" [abstract], by Ronald L. Crawford et al., in BMC Microbiology, 6 March 2003. 2003, March 31: Changing dark spots on Mars biological? 2003, March 29: More about the fresh dark streaks on Mars. Pasteur: Payload Opportunities to Search for Life on Mars, European Space Agency (ESA), 27 Mar 2003. Faulty component delays Mars Express launch by Will Knight, NewScientist.com, 18 Mar 2003. 2003, March 14: Water flowing on Mars now? Gray Iron Oxide on Mars by Linda M.V. Martel, Hawai'i Institute of Geophysics and Planetology, 13 Mar 2003. Red Rovers: Returning to Mars by Henry Bortman, Astrobiology Magazine, 12 Mar 2003. Richard A. Kerr, "New Front-Runner for Carving Martian Gullies" [summary], p 1294 v 299 Science, 28 Feb 2003. "Lingering snow patches might harbor life still." Philip R. Christensen, "Formation of recent martian gullies through melting of extensive water-rich snow deposits" [abstract], doi:10.1038/nature01436 Nature AOP, published online 19 Feb 2003. Timothy N. Titus et al., "Exposed Water Ice Discovered near the South Pole of Mars" [abstract], p 1048-1051 v 299 Science, 14 Feb 2003; and Supporting material for Science paper press release by Shane Byrne and Andrew Ingersoll, Arizona State University. Victoria E. Hamilton et al., "...Volcanism or aqueous alteration on Mars?" [abstract], p 711-712 v 421 Nature, 13 Feb 2003. 2003, February 5: Small gullies on Mars caused by water? 2003, January 29: A discussion of panspermia. Early Mars: Oceans Away? by David Tenenbaum, Astrobiology Magazine, 27 Jan 2003. Mars and the Final Four [possible landing sites], NASA, JPL, 14 Jan 2003. Ready to Dig the Dirt on Mars, The University of Leicester, November 2002. How Life Might Have Formed in Martian Impact Craters, by David Tenenbaum, Space.com, 19 Nov 2002. Why a Mars Rock Hits Earth Every Month, by Robert Roy Britt, Space.com, 7 Nov 2002. Mars's Hidden Glaciers, Academic Press Daily InScight, 30 Oct 2002. Martian water is prime candidate [to have made gullies], by David Whitehouse, BBCNews, 29 Oct 2002. 2002, October 30: Paul Davies thinks life came from Mars. 2002, Sep 25: Bacteria evolved on Mars? No place for life to hide from Mars Express, ESA, 3 Sep 2002. The Wet, Oxidizing Crust of Mars by G. Jeffrey Taylor, Hawai'i Institute of Geophysics and Planetology, 30 Aug 2002. Russian scientists set ambitious Mars mission for 2007, Agence France-Presse, SpaceDaily, 20 Aug 2002. Microorganisms Grow at Low Pressure, Implying Possible Life on Mars', University of Arkansas, 15 Aug 2002. No bugs please, this is a clean planet!, ESA, 30 July 2002. 2002, July 31: Mars sample return? Worlds of Life Beyond Earth, by Pat Shell, SpaceDaily, 11 June 2002. 2002, May 29: Lots of water on Mars! Probability of alien life rises, by Jeff Hecht, New Scientist, 19 May 2002. The Tricky Business of Identifying Rocks on Mars, by G. Jeffrey Taylor, Hawai'i Institute of Geophysics and Planetology, 22 May 2002. Study Urges Caution on Mars Trip, by Randolph E. Schmid, AP, LATimes.com, 1 May 2002. No Green Seen on the Red Planet, by David L. Chandler, Astronomy.com, 21 Apr 2002. New Mars model says 'no' to life, The University of Melbourne, via UniNEWS Vol 11 #8, 8 April 2002. Life on Mars hopes raised, by David Whitehouse, BBCNewsOnline, 5 Apr 2002. Martian spots warrant a close look, European Space Agency, 13 Mar 2002. 2002, Mar 12: Mars — We're Back!. Mars May Have Vast Quantities of Ice, by Andrew Bridges, Los Angeles Times, 1 Mar 2002. 2002, Feb 26: Recent floods on Mars. Life On Mars: Native, Or Carried There From Earth?, by Jim Barlow, UniSci, 19 Feb 2002. MOC ...image E05-00762: Defrosting dune survey on plain [but they look like vegetation!] with links to higher resolution images, Malin Space Science Systems, released 7 May 2002. Newly Discovered Antarctic Microbes Suggest Life Is Possible In Terrains on Mars, by Lori Stiles, the University of Arizona, 14 Jan 2002. 2001, December 15: Mars may have formed with enough water to cover its entire globe to a depth of 1¼ kilometers. John Noble Wilford, "Mars Orbiter Sees a Climate That's in Flux" [text], The New York Times, 7 Dec 2001. ...Differences In The Early Evolution Of ...Earth, Mars..., by F. Westall and A Brack, Eos Trans. AGU, 82 (47), Fall Meet. Suppl., Abstract P22B-0542, 10-14 Dec 2001. New Evidence Suggests Mars Had Water, by Paul Recer, Los Angeles Times, 29 Nov 2001. Peter R. Buseck et al., "Magnetite morphology and life on Mars" [abstract], p 13490-13495 v 98 n 24 Proc. Natl. Acad. Sci. USA, 20 November 2001. Challenges the biological interpretation. Larry O'Hanlon, "The Outrageous Hypothesis" [text], p 664-666 v 413, Nature, 18 October 2001. Did CO2 carve the gullies on Mars? Ancient, Gigantic Drainage Basin Became Aquifer on Mars, by Lori Stiles, University of Arizona, 9 Oct 2001. 2001 Odyssey Mission to Mars, Space.com, undated Special Report. Inflating Mars by Morris Jones, SpaceDaily, 11 September 2001. 2001, September 7: Dark spots which spread every Martian spring could prove there is life on Mars. Evidence of Recent Climate Change on Mars, NASA's Astrobiology Institute, 7 Sep 2001. Why Microbes Matter by David M. Warmflash, SpaceDaily, 4 September 2001. Plenty of Water on Mars by Susan Loden, SpaceDaily, 31 August 2001. 2001, August 31: Europeans will seek water on Mars. Having a Ball on Mars from the ARC Astrobiology Institute, [publicised] 22 Aug 2001. Water on Mars: Not So Ancient, After All from the ARC Astrobiology Institute, [publicised] 16 Aug 2001.
recent news from the JSC Astrobiology Institute for the study of biomarkers. Evidence of icy region and recent climate change observed on Mars, Brown Univesity News Service, 26 July 2001. Life On Mars: Swimming Right Under the Surface?, by Robert Roy Britt, Space.com, 24 July 2001. Dust storm heats Mars by 30C, Science@NASA, 16 July 2001. John VanDecar and Karl Ziemelis, "Mars" [text] p 201 v 412, Nature Insight, 12 July 2001. Intro with links to six more articles about Mars. Researcher: Mars rock varnish hints of life, by Richard Stenger, CNN.com, 2 July 2001. Electronic Astrobiology Newsletter, from "Marsbugs, 18 June 2001. Several news items about Mars. A Pregnancy Test for Mars, by Roberta Friedman, NASA's Astrobiology Institute, 18 June 2001. Swiss Discover Mars Meteorite, Excite.com/News, 15 June 2001. Outflow Channels May Make a Case for a Bygone Ocean on Mars, by Linda M.V. Martel, Hawai'i Institute of Geophysics and Planetology, 14 June 2001. NASA selects candidates for 2007 mission to Mars, CNN.com/Space, 13 June 2001. Swept Away: Evidence of Erosion on Mars, NASA Ames, [posted] 13 June 2001. 2001, June 13: A Mars meteorite contains water; and "rootless cones" on Mars. Tony Reichhardt. "Mars rock samples condemned to quarantine" p 625 v 417 Nature, 7 June 2001. 2001, May 29: Any samples returned from Mars must be quarantined. ...Canadian Space Agency Announces Major Mars Initiative, by Chandra Clarke, SpaceRef.com, 25 May 2001. ...Bold New Proposals for Exploring The Red Planet, by Leonard David, Space.com, 21 May 2001. Mars Explorers to Benefit from Australian Research, by Michael Paine, Space.com, 15 May 2001. Humans Could Set Foot On Mars By 2020, SpaceDaily.com, 9 May 2001. Colorful Water Clouds Over Mars, Astronomy Picture of the Day, 17 April 2001. Richard A. Kerr. "Rethinking Water on Mars and the Origin of Life" [summary], p 39-40 v 292 Science, 6 April 2001. 2001, April 2: Carbon dioxide made gullies on Mars? The Lure of Hematite, Science@NASA, 28 March 2001. Mars or Europa: Where Does Life Exist?, by Robert Roy Britt, Space.com, 28 March 2001. 2001, March 28: British mission may return first Mars sample. Can Liquid Water Exist on Present-day Mars?, NASA Astrobiology Institute Update for 26 March 2001. Spy Agency May Have Located Mars Polar Lander, by Leonard David, Space.com, 19 March 2001. 2001, March 7: The 32nd Lunar and Planetary Science Conference, March 12-16, Houston, TX. John D. Rummel. "Planetary exploration in the time of astrobiology: Protecting against biological contamination" [abstract], p 2128-2131 v 98 n 5 Proc. Natl. Acad. Sci. USA, 27 February 2001. 2001, January 31: Where to land on Mars / National Geographic. Life on Mars? New Research in Arkansas, by Suzi Parker, The Christian Science Monitor, 30 January 2001. Henry Fountain. "Clues on Martian Water," The New York Times, 30 January 2001. 2001, January 30: Jupiter-like planets may be needed for life on smaller ones. Martian Ice Puts Arizona Scientist In The Groove, SpaceDaily, 17 January 2001. New Evidence Suggests Mars Has Been Cold and Dry: "Red Planet" Abundant with Green Minerals, USGS pressrelease, October 2000. MOC Image m0803500, Mars Global Surveyor, [n.d.] This image shows plumes and shadows on Mars that may be a geyser field. Mars' Magnetic Patchwork May Protect Atmosphere, SpaceDaily.com, 18 December 2000. 2000, December 12: Present-day liquid water on Mars? Mars Probes Take On Tough Challenges, by Leonard David, SpaceViews.com, 29 November 2000. Sample return pushed back to 2014. 2000, December 3: Ancient sea or lake beds on Mars? Look inside Mars' frosty craters, MSNBC.com, 27 November 2000. Recent Lakes on Mars, about work by Nathalie Cabrol, NASA's Astrobiology Institute. 2000, November 16: The European Space Agency reports on Mars. Mars may still rumble [active volcanoes? ], by David Whitehouse, BBC News, 6 November 2000. Humans On Mars: NASA on the Defensive, Space.com, 6 November 2000. 2000, November 9: Ancient Bacteria in Salt Crystals on Mars? Mars sample return plan carries microbial risk, group warns, by Richard Stenger, CNN.com, 7 November 2000. 2000, October 27: NASA announces new Mars program. 2000, October 23: An astrobiologist's recommendations for Mars. Conference On The Geophysical Detection Of Subsurface Water On Mars, 6-10 August 2001, Lunar and Planetary Institute, Houston, Texas. NASA Warms to Living on Mars, by Leander Kahney, Wired.com, 11 October 2000. 2000, October 2: NASA's new Mars plan to be announced this month. Origin of Salts in the Dry Valleys of Antarctica Provide Clues to Atmospheric Depositions on Mars, UCSD, 27 September 2000. 2000, September 26: Organic Pigments on Mars? 2000, September 20: Mars appears to have a huge underground ice reservoir. Experiment Shows Mars Needs to Take Antioxidants for Life, JPL/NASA, 14 September 2000. 2000, September 15: ESA's Beagle 2 to touch down in Mars' Isidis Basin. New Clues About Martian Meteorites Baffle Scientists, by Greg Clark, Space.com, 30 Aug 2000. 2000, August 22: Renewed interest in liquid water on Mars. 2000, August 17: Mars Society to sponsor life-detecting microscope aboard ESA's Mars Express. 2000, August 10: NASA will send twin rovers to Mars. Dry floods on Mars, Exoscience, 5 August 2000. 2000, July 21: Scientists divided over timing of Mars sample return; and Active volcanoes on Mars. Quietly, Evidence Mounts for Active Volcanism and Water On Mars, by Greg Clark, Space.com, 19 July 2000. Mars: Take the Long Road, by Andrew Bridges, Space.com, 16 July 2000. 2000, July 4: Could Mars' recent gullies have been made by gas? Mars Sample Return: The Medium-Lift Approach, by Morris Jones, SpaceDaily.com, 1 July 2000. 2000, June 28: More about water on Mars. 2000, June 21: NASA may see brackish water seeping from beneath the surface of Mars. The Martian Landscape, NASA History Office, 9 June 2000. 2000, May 18: A report from a recent "Life Detection" workshop [in the "Marsbugs" newsletter]. Could Mars Have Ever Supported Life?, by Bruce Moomaw, SpaceViews, 2 May 2000. 2000, March 19: The Mars sample return mission is postponed. View Inside Mars Reveals Rapid Cooling and Buried Channels, by Michael Starobin, Goddard Space Flight Center, NASA, 13 March 2000. How to spot a Martian, by Philip Ball, Nature: science update, 2 March 2000. 2000, February 12: Chandra Wickramasinghe and Barry DiGregorio chat with Laura Lee. Marsbugs: The Electronic Astrobiology Newsletter. 2000, February 1: Two new Mars meteorites found. William J. Broad. "Evidence Builds That Mars Lander Is Source of Mystery Signal," The New York Times, 1 February 2000. 2000, January 28: Russia plans space probe to Mars in 2005. 1999, December 31: Astrobiologists will send bacteria into space and back. Mars Sample Return, the NASA website. 1999, December 10: More evidence for past ocean on Mars. 1999, December 7: Are Martian Germs Dangerous? Sharon Begley. "The New Search for Life on Mars," (cover story) p 54-60 Newsweek, 6 December 1999. 1999, December 5: Silence from Mars Polar Lander. Mars Missions: News and Information, from JPL, NASA. The Astrobiology, Extreme Environments and Terraformation Index, by David J. Thomas, creator of "Marsbugs: The Electronic Astrobiology Newsletter." Lots of good links. Pioneers Aim for Mars, by Kurt Anderson, The Christian Science Monitor, 20 October 1999. Internet version on ABCNews.com, 21 October 1999. A case for colonizing Mars. Mars or Bust (meeting brief), by Sibylle Hechtel, issue 64 HMSBeagle, 15 October 1999. 1999, October 7: More microbes survive in space. 1999, September 23: NASA loses contact with Mars Orbiter. Does Mars Hide Vast Water Deposits, by Johann Helgason, SpaceDaily.com, 21 September 1999. Mars News, an excellent site sponsored by The Mars Society. Mars mound might have been built by microbes, by Lou Bergeron, New Scientist, 2 September 1999. Life on Mars? : Polar Lander Continues the Search, Discovery Channel Online, 1999. 1999, June 27: ESA's Mars Express will be launched in June 2003. Scientists Grow Methanogens Under Mars-Like Conditions, UniSci 02 June 1999. 1999, May 28: The first global three-dimensional map of Mars shows likely former ocean basin. 1999, May 27: Search for life on Mars will start in Siberia. Green light to Red Planet-- The European Space Agency (ESA) has given the final go-ahead to the Mars Express mission. BBC News, 24 May 1999. 1999, May 19: A giant cyclone on Mars confirms water there. 1999, April 29: Pictures of magnetic field reversals on Mars show that tectonic plates there have moved. 1999, January 12: NASA has published its Astrobiology Roadmap. 1999, January 11: Barry DiGregorio writes about ICAMSR in "Replies...". 1999, January 9: A mission to look for water in the south polar regions of Mars lifted off successfully. 1998, June 26: Microbial life discovered two meters below permanent ice in Antarctica. 1998, May 27: Mars Orbiter Camera shows probable ponding within a southern hemisphere crater. 1998, May 27: Hematite deposits on Mars most likely created by hydrothermal vents or evaporated seas. 1998, April 11: A huge rock formation on Mars may be a giant fossil left billions of year ago by microbes. 1998, March 20: The 29th Lunar and Planetary Conference (LPSC), March 16-20 1998. 1998, February 14: Rocks on Mars appear to be coated with "desert varnish." 1998, January 29: NASA must spend millions to upgrade equipment for analyzing samples from Mars. 1998, January 15: France may take part in a US expedition to collect samples of Martian rock. 1997, November 22: NASA scientists now say that Mars may still support life. Comments on the June 7, 2018, NASA News Release and Papers by Gilbert V. Levin and Patricia Ann Straat, Astrobiology, 16 Jul 2018. NASA May Have Discovered and Then Destroyed Organics on Mars in 1976 by Chelsea Gohd, Space.com, 11 Jul 2018. Searching for Life on Mars Before It Is Too Late by Alberto G. Fairén et al., Astrobiology, online Sep 2017. Unfortunately, with the exception of the two Viking landers in 1976, all other lander and rover missions to Mars have been in fact primarily geology focused, although they are often put forward as astrobiology missions. The Case for Extant Life on Mars and Its Possible Detection by the Viking Labeled Release Experiment, by Gilbert V. Levin and Patricia Ann Straat, doi:10.1089/ast.2015.1464 [PDF], Astrobiology, online 14 Sep 2016. 30 Jul 2016: The Washington Post discusses possible life on Mars. Celebrating Viking: Gilbert Levin Recalls the Search for Life on Mars by David Warmflash, Discover, 20 Jul 2016. ...proposals ...were always rejected with the flat statement that no life detection tests would be funded. 31 Mar 2015: ...Since [Viking], there has been no sign of so much as a bacterium. Eric Hand, "Mars rover finds long-chain organic compounds" [summary], doi:10.1126/science.347.6229.1402, Science, 27 Mar 2015. "...even a possible 10-carbon carboxylic acid resembling a fatty acid, a type of molecule found in cell walls...."
19 Dec 2014: Molecules found by Curiosity on Mars have been confirmed as organic matter. Richard A. Kerr, "Search for Martian Life Clears Another Hurdle" [abstract], doi:10.1126/science.343.6178.1419, p 1349 v 343, Science, 28 Mar 2014. Gil Levin explains the Viking tests for life on Mars in a 24-min. video posted by ExploreMars, 03 Aug 2014. 13 Dec 2013: This is combustion of organic carbon, folks. Do We Have Edidence for Life on Mars?, Gil Levin and Chris McKay, Huffington Post, 18 Jul 2013. 14 Jul 2013: Gilbert Levin ...presents the argument that their 1976 [LR] experiment ...discovered life on Mars. Giorgio Bianciardi, Joseph D. Miller, Patricia Ann Straat and Gilbert V. Levin, "Complexity Analysis of the Viking Labeled Release Experiments" [abstract | PDF], doi:10.5139/IJASS.2012.13.1.14, p14-26 v13, Int'l J. of Aeronautical & Space Sci., Mar 2012. 30 Dec 2010: a DVD of Dr. Levin discussing the LR with Barry DiGregorio is available from amazon.com. 13 Sep 2010: Barry DiGregorio's 1997 book, Mars the Living Planet, is available for download from Amazon. 26 Aug 2010: Barry DiGregorio alerts us to a forthcoming article reanalyzing the GCMS experiment. 18 Aug 2010: A life-detection experiment on Mars... is described in detail by its inventor, Gil Levin. 20 May 2008: Caltech reconsiders life on Mars in an illustrated retrospective article. 8 Jun 2007: Liquid water on the surface of Mars?! Gilbert V. Levin, "Analysis of evidence of Mars life" [lecture summary | Spanish PDF], The Carnegie Institution Geophysical Laboratory Seminar, 14 May 2007. Mario Crocco, "First biological classification of a Martian organism, genus Gillevinia" [Spanish text], Electroneurobiología, 14 Apr 2007. Mariela Szirko, "Comentario editorial: la cuestión epistemológica en la detección de vida en Marte" [Spanish text], Electroneurobiología, 2 Feb 2007. Gilbert V. Levin, "Modern Myths Concerning Life on Mars" [text | Spanish text], Electroneurobiología, 30 Nov 2006. 22 May 2007: Gil Levin writes to report availability of "Analysis of evidence of Mars life". 8 Jan 2007: The findings by the Viking experiments are reinterpreted. 24 Oct 2006: Did Viking find life on Mars? Spherix founder looks to heavens for future of science, by C. Benjamin Ford, The Gazette (Maryland), 13 Feb 2004. 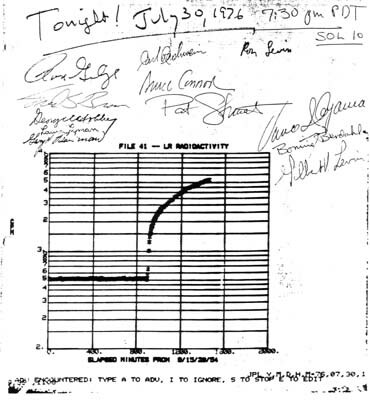 Levin's team at NASA celebrated this LR graph. ...An Interview With Dr. Gilbert Levin, by Barry E. DiGregorio, 17 Nov 2003. Rafael Navarro-González et al., "Mars-Like Soils in the Atacama Desert, Chile, and the Dry Limit of Microbial Life" [abstract], p 1018-1021 v 302, Science, 7 Nov 2003. "...Active decomposition of organic species ...by nonbiological processes." 2003, September 15: A freezing cold Mars could have supported life. ...New Evidence For Liquid Water..., by Gilbert V. Levin, Spherix Inc., 29 July 2003. 2003, June 24: An in-depth commentary on the Viking mission's tests for life on Mars is posted. I Found Life on Mars in 1976, Scientist Says, by Stefan Lovgren, National Geographic News,11 June 2003. The Viking Files, Astrobiology Magazine, 3 June 2003. Historic Mars lander 'did find life', by Helen Briggs, BBC News Online, 29 May 2003. Viking Data Still Cause Stir About Mars Life by Michael Paine, Space.com, 5 September 2001. 2001, July 20: Twenty-fifth Anniversary of Viking's Landing on Mars. Rethinking Viking: The Life on Mars Debate Rages On, by Leonard David, Space.com, 20 July 2001. 2001, February 7: More about Viking LR experiment on Mars. 2001, February 2: Biological interpretation of Viking LR experiment can no longer be ruled out. New Information Supports Claim Viking Discovered Life in 1976, SpaceDaily, 1 August 2000. Viking Data May Hide New Evidence For Life, by Barry E. DiGregorio, SpaceDaily, 16 July 2000. Viking Orbiter Views of Mars, NASA History Office, 9 June 2000. 2000, May 19: Do rhythms in the 1976-1977 Viking data point to life? 2000, March 18: Organics on Mars may have left traces overlooked by the Viking landers. Liquid water and life on Mars, by Gilbert V. Levin and Ron L. Levin, Biospherics Incorporated, 1998. 12 Dec 2017 Large impacts on Mars can launch meteorites without heavily shocking them. 10 Mar 2013 David S. McKay died on February 20th. 12 May 2010: Past life on Mars is still the best explanation for the fossils in ALH84001. A Younger Age for the Oldest Martian Meteorite by G. Jeffrey Taylor, Hawaii Institute of Geophysics and Planetology, 12 May 2010. 11 Dec 2009: David S. McKay sends email with additional information and links. 1 Dec 2009: Ancient life remains the most plausible explanation for the materials and structures found in the Mars meteorite. Dirk Schumann et al., "Gigantism in unique biogenic magnetite at the Paleocene-Eocene Thermal Maximum" [abstract], p 17648-17653 v 105, Proc. Natl. Acad. Sci. USA, 18 Nov 2008. 9 Feb 2006: More evidence for past life on Mars comes from the Nakhla meteorite. Mars Has Been In Deep Freeze For Past Four Billion Years..., SpaceDaily, 19 Jul 2005. The Other Mars Meteorite, Astrobiology Magazine, 15 Sep 2004. A Case for Life on Mars, SpaceDaily, 11 Sep 2002. Breathing Life Into Old Martian Rocks, SpaceDaily, 22 Aug 2002. Press Releases and Publications about ALH84001, JSC Astrobiology Institute for the study of Biomarkers, [latest publication] 5 Aug 2002. Magnetite on Mars Meeting, NASA Ames Research Center, 4-5 June 2002. 2002, May 14: Magnetites in Mars meteorite nonbiological? Doubts About ALH84001: The JSC Mars Meteorite Team Responds, from NASA's Astrobiology Institute, [publicised] 3 Dec 2001. "The Buseck et al. paper appears to be little more than a poorly disguised advertisement for the technique of electron tomography...."
2001, February 27: The case for Martian bacteria grows stronger. 2000, December 13: Evidence for magnetotactic bacteria on Mars. New results on Martian meteorite..., by Robert Tindol, Caltech Media Relatins, 26 October 2000. ALH 84001 Evidence Grows Weaker, by Bruce Moomaw, SpaceDaily.com, 11 April 2000. 2000, January 10: Mars meteorite contains biologically produced magnetites? Life on Mars --The Evidence Grows, by Greg Clark Space.com, 13 August 1999. 1999, July 21: New evidence of fossilized bacteria in two Martian meteorites presented. 1999, March 19: Other meteorites may show life on Mars. 1998, November 30: Scientific consensus for the Mars microbes is weakening. 1998, July 25: David S. McKay continues to see evidence for life on Mars, and Gil Levin sees water there. 1998, April 18: A meteorite from northern Africa may strengthen the case for ancient life on Mars. 1997, December 4: The debate over the evidence for past life on Mars continues. First Detailed Microscopy Evidence of Bacteria at the Lower Size Limit of Life by Dan Krotz, Berkeley Lab (+Newswise), 27 Feb 2015. See TEM image at right; scale bar = 100 nanometers. Brett J. Baker et al., "Enigmatic, ultrasmall, uncultivated Archaea" [abstract], doi:10.1073/pnas.0914470107, Proc. Natl. Acad. Sci. USA, online 26 Apr 2010; and commentary: Weird, ultra-small microbes turn up in acidic mine drainage by Robert Sanders, UC Berkeley, 3 May 2010. Purported nanobacteria in human blood as calcium carbonate nanoparticles by Jan Martel and John Ding-E Young, doi:10.1073/pnas.0711744105, PNAS, 08 Apr 2008. Nanobacteria in clouds could spread disease, scientists claim, by Chandra Wickramasinghe, MediLexicon, 7 Apr 2005. Are Nanobacteria Making Us Ill?, by Amit Asaravala, Wired News, 14 Mar 2005. 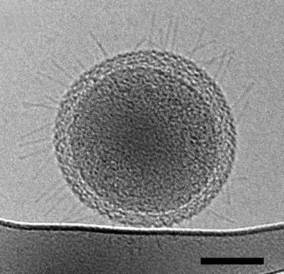 Nanobacteria revelations provoke new controversy, by Jenny Hogan, New Scientist, 22 May 2004. 2003, August 6: Just balls of protein? 2003, March 24: Nanobacteria continue to puzzle science. Martian rock 'does contain life', David Whitehouse, BBCNews, 23 Oct 2002. More evidence for 'nanobes' — "Philippa Uwins of the University of Queensland announced at a conference in Adelaide on Monday that she had confirmed the presence of DNA in ...'nanobes'," 19 Dec 2001. 2001, July 9: NAI considers nanobes. John O. Cisar et al., "An alternative interpretation of nanobacteria-induced biomineralization" [abstract], p 11511-11515 v 97, Proc. Natl. Acad. Sci. USA, 10 Oct 2005. 2000, May 16: Proceedings of a conference on nanobacteria, October 22-23, 1998. 2000, April 21: Nanobacteria continue to surprise microbiologists. 2000, March 9: The nanofossils in Tatahouine are biological. Do nanobacteria rule Earth and Mars?, by David Whitehouse, BBCNews Online, 22 March 1999. 1. Meteorite Yields Evidence of Primitive Life on Early Mars, NASA News Release 96-160, 7 August 1996. 2. Richard Dawkins, The Blind Watchmaker, W.W. Norton and Company, 1987. p 164. 3. John D. Barrow and Frank J. Tipler. The Anthropic Cosmological Principle, Oxford University Press, 1986. p 19. 4. John D. Barrow and Frank J. Tipler. The Anthropic Cosmological Principle, Oxford University Press, 1986. p 124. 5. David S. McKay, Everett K. Gibson Jr., Kathie L. Thomas-Keprta, Hojatollah Vali, Christopher S. Romanek, Simon J. Clemett, Xavier D. F. Chillier, Claude R. Maechling and Richard N. Zare. "Search for Past Life on Mars: Possible Relic Biogenic Activity in Martian Meteorite ALH84001" [abstract], doi:10.1126/science.273.5277.924, p 924-930 v 273 Science, 16 August 1996. 6. Gilbert V. Levin and Patricia Ann Straat, "Life on Mars? The Viking labeled release experiment" p 165-174 v 9 Biosystems, September 1977. Also see: Rick Gore, "Sifting for Life in the Sands of Mars" p 9-31 v 151 n 1 National Geographic, January 1977. 8. Imre Lakatos, The methodology of scientific research programmes: Philosophical Papers Volume I, John Worrall and Gregory Currie, eds. (first published 1978) Cambridge University Press, 1995. p 27. 9. A. H. Treiman, "Thinking About Life on Mars: Dangers and Visions", presented 20 March 1997, at the 28th Lunar and Planetary Conference in Houston Texas. A list of all abstracts is available at 28th LPSC Abstracts of Interest with links to full text. 10. Fred Hoyle, The Intelligent Universe: A New View of Creation and Evolution, London: Michael Joseph Limited, 1983. p 102-107. 11. William J. Broad, "Could Life on Loose Bit of Mars Survive a Short Cut to Earth?" p B5,B7 The New York Times, 12 March 1996. 12. See Fossilized Life Forms in the Murchison Meteorite, 29 July 1997, this website. Achenbach, Joel. "The Genesis Problem," p W12 The Washington Post, 2 November 1997. Askyonov, S. I. "Some Comments on Interpretations of the Viking Biological Experiments," p 251-256 v 9 Origins of Life, 1979. Bada, Jeffrey L.; Daniel P. Glavin; Gene D. McDonald and Luann Becker. "Search for Endogenous Amino Acids in Martian Meteorite ALH84001" p 362-365 v 279 Science, 16 January 1998. Bizony, Piers The Rivers of Mars: Searching for the Cosmic Origins of Life, London: Aurum Press, 1997. Carr, Michael H. Water on Mars, Oxford University Press, 1996. Chown, Marcus. "Seeds, soup and the meaning of life" p 6 New Scientist, 17 August 1996. Cowen, Ron. "Searching for Life in a Martian Meteorite" Science News Online, 14 December 1996. Davis, Wanda L. and Christopher P. McKay. "Origins of Life: A Comparison of Theories and Application to Mars," p 61-73 v 26 Origins of Life, 1996. DiGregorio, Barry E. Mars: The Living Planet with Dr. Gilbert V. Levin and Dr. Patricia Ann Straat. Berkeley, CA: Frog Ltd., 1997. A Radio Interview with Barry that aired 2 May 1998, is available. Edgar, Blake. "Message in a Meteor: Maybe Men and Women Are From Mars" Pacific Discovery, Winter 1997. Gibbs, W. Wayt. "Endangered: Other explanations now appear more likely than Martian bacteria" p 19-20 v 278 n 4 Scientific American, April 1998. Gibson, Everett K., Jr.; David S. McKay; Kathie Thomas-Keprta and Christopher S. Romanek. "The Case for Relic Life on Mars" p 58-65 v 277 n 6 Scientific American, December 1997. Hoyle, Fred and Chandra Wickramasinghe. Life on Mars? The case for a cosmic heritage? Bristol: Clinical Press, 1997. Jull, A. J. T.; C. Courtney; D. A. Jeffrey and J. W. Beck. "Isotopic Evidence for a Terrestrial Source of Organic Compounds Found in Martian Meteorites Allan Hills 84001 and Elephant Moraine 79001" p 366-369 v 279 Science, 16 January 1998. Lavoie, J. M., "Support Experiments to the Pyrolysis/Gas Chromatograph/Mass Spectrometric Analysis of the Surface of Mars," Ph.D. Thesis, Massachusetts Institute of Technology, Cambridge, MA, 1979. Levin, Gilbert V. and Patricia Ann Straat "Labelled Release — an Experiment in Radiorespirometry," p 293-311 v 7 Origins of Life, 1976. Reprint. Levin, Gilbert V. and Patricia Ann Straat "Antarctic Soil No. 726 and Implications for the Viking Labeled Release experiment," J. Theor. Biol., 91, 41, 1981. McKay, David S.; E. K. Gibson, Jr.; K.L. Thomas-Keprta and C. S. Romanek. "Evidence for possible past life in a Martian meteorite: a current assessment," in Instruments, Methods, and Missions for the Investigation of Extraterrestrial Microorganisms, Richard B. Hoover, Editor, Proceedings of SPIE Vol. 3111, p 2-6 (1997). Melosh, H. J. "The Rocky Road to Panspermia" p 687-688 v 332 Nature, 21 April 1988. Melosh, H. J. and W. B. Tonks Swapping Rocks: Ejection and Exchange of Surface Material Among the Terrestrial Planets: Abstract of paper presented at the 56th Annual Meeting of the Meteoritical Society. Nash, J. Madeleine. "Was The Cosmos Seeded With Life?" v 148 n 9 TIME Magazine, 19 August 1996. Newcott, William R. "Return to Mars" v 194 n 2 p 2-29 National Geographic, August 1998. Smolin, Lee, "We All Came From Mars!" [text] (review of The Fifth Miracle by Paul Davies) p 12, Book Review Section, The New York Times, 18 April 1999. Strughold, Hubertus. The Green and Red Planet: a Physiological Study of the Possibility of Life on Mars, The University of New Mexico Press, 1953. Taylor, Michael Ray, Dark Life: Martian Nanobacteria, Rock-Eating Cave Bugs, and Other Extreme Organisms of Inner and Outer Space, Scribner, 1999. Wade, Nicholas. "Mars Meteorite Fuels Debate on Life on Earth" p B9,B12 The New York Times, 29 July 1997.
International Committee Against Mars Sample Return - a group, founded by LR experiment designer Gilbert Levin and author Barry DiGregorio, opposed to the returning of samples from Mars directly to Earth because the samples could contain unfamiliar, dangerous germs. The University of Florida Joins NASA'S Virtual Astrobiology Institute to Look for Life on Mars, by Kristen Vecellio, 10 Nov 1998. Steven Benner says that except for repeating electric charges, "the rest of the genetic molecule will vary from life form to life form and from planet to planet." Swapping Rocks: Exchange of Surface Material Among the Planets, by H. Jay Melosh. Mars Express wins unanimous support from the European Space Agency, 5 Nov 1998. Did Earth's Life Originate on Mars? by Paul Lutus. On the Question of the Mars Meteorite from The Lunar and Planetary Institute. Mars, one of Bill Arnett's The Nine Planets, an excellent resource. Mars, part of Welcome to the Planets from JPL, NASA. Ancient meteorite may point to life on Mars, CNN, 7 August 1996. Mars Sample Return Workshop, 1996: "The Detection of Amino Acids on Mars" by Jeffrey L. Bada. More findings about life on the Red Planet, by R. Cowen. ScienceNewsOnline, 8 February 1997. Mars Sample Return: Issues and Recommendations, National Academy Press, Washington DC, 1997. Viking Mission to Mars, a NASA official website. Mars Links is a resource organized by students from all over the world. Visions :SETI (Bioastronomy) at "The Telson Spur" — a good collection of links. Interview with Richard Hoover, December 1996. Reviews the ALH84001 evidence. CNN - Mission: Mars, 7 November 1996. Life on Mars? The Evidence and the Debate by G. Jeffrey Taylor PSR Discoveries, 18 October 1996. Meteorite Yields Evidence of Primitive Life on Early Mars, from NASA, JPL, 7 August 1996.